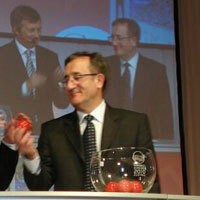 The Preliminary Round of the EHF EURO 2010 in Austria will be drawn on 24 June in Vienna. The 9th Men's European Championship Final Tournament will take place from 19 to 31 January 2010. After the completion of the qualification groups for the Men’s EHF EURO 2010, the Final Tournament Draw is coming up in Vienna. The EHF EURO 2010 Preliminary Round Groups will be drawn on Wednesday, 24 June 2009, 18:00 hrs (starting time of draw 19:00) on the occasion of the EHF Champions’ Draw event in the Liechtenstein Museum in Vienna. Later on this evening, the upcoming season for the Women’s and Men’s EHF Champions League will be drawn. Over 300 representatives from Austria and all over Europe have confirmed their participation for this occasion. Altogether 16 teams divided into four pots qualified via the qualification matches which took place according to a new competition format in ten rounds between October 2009 and June 2009. In addition to the 14 nations qualifying from the qualification groups, Denmark is qualified as defending champion and Austria as organiser. Austria will participate in a European Championship Final Tournament for the first time in the EURO Events history. The Men’s EHF EURO 2010 Preliminary Round matches will be played in Graz, Linz, Innsbruck and Wr. Neustadt; the Main Round Groups will be played in Vienna and Innsbruck; and the Final Weekend will be played in Vienna. The teams have been seeded for the draw in accordance with their qualification group results. The first ranked teams of the qualification groups and the defending champion are seeded in Pot 1 and 2; the second ranked teams of the qualification and the organiser are in Pot 3 and 4. The draw procedure of the EHF Euro 2010 in Austria involves that the organiser assigns one team to each group and together with the EHF defines the venue assignment prior to the event. First row 1 will be drawn into groups giving priority for the best ranked teams. Row 3 – including the organiser – will follow and finally row 2 and 4 will be drawn into groups. The draw event will be transmitted by the host broadcaster ORF and will be streamed live on the official event website, www.ehf-euro.com. All specific details regarding the EHF Euro 2010 can be found on the official tournament website, www.ehf-euro.com, and the European Handball Federation homepage, www.eurohandball.com.